Steve Clarke's first game as Reading manager ended in defeat as Watford stayed within four points of Championship leaders Bournemouth. The Hornets played 45 minutes with 10 men after losing Gabriele Angella to a second yellow card before the break. Reading had several chances to take the lead but Glenn Murray missed a couple of opportunities while Nick Blackman sliced wide from a yard out. Watford came away with the win thanks to Almen Abdi's strike from 18 yards. The result means Watford remain in sixth position, while the Royals are 17th and six points above the relegation zone. 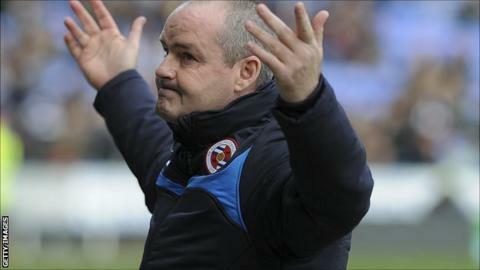 Having sacked manager Nigel Adkins on Monday, Reading appointed Clarke as their new boss a day later. Before Saturday's game the former West Brom head coach announced Kevin Keen would be his new assistant at the Madejski Stadium, while Alex Pearce would replace Chris Gunter as captain. Clarke's tenure almost got off to the perfect start, however Murray could not keep his volley on target. At the other end keeper Adam Federici comfortably held Abdi's half volley, but it was the hosts who had the best chances of the opening 45 minutes. Reading have now not scored in their last three home games, losing 1-0 twice and picking up a point from a 0-0 draw with Bolton. Blackman headed over the bar from seven yards out and Murray nodded Jordan Obita's cross the wrong side of the post. Despite failing to muster a shot on target, Reading's fans were buoyed by the red card to Watford defender Angella who was sent off for a second-bookable offence after handling the ball on the edge of the area. With a man advantage Clarke's men went in search of the opener and Murray raced clear but he was isolated and, after cutting inside, his strike curled wide. Garath McCleary had a shot saved with Chris Gunter firing the rebound into the side netting. Soon after, McCleary's cross found Blackman at the far post but he missed from a yard out. Watford took advantage of that miss with Abdi giving them the lead with a sweetly struck shot from just inside the box to stun the Madejski Stadium. "Watford are a top-six team and yet we showed that we can match them. The only thing we didn't do was stick the ball in the net. "This is a league in which if you can get a bit of momentum, or turn things round and get on a roll, you can very quickly go up the table. "We had enough of the ball and enough of the game without getting our noses in front. The first goal was going to be crucial and, unfortunately, it fell to them." "It was a very important win for us. I was very proud of the team, especially in those last 15 minutes. I wasn't so happy with the first 45 minutes. "We did not start very well, Reading were stronger than us and we made unnecessary mistakes. But we had a big reaction in the second half. We worked hard together as a team, scored the goal and kept the clean sheet. "It is very important to win these type of games, it will give us great confidence." Match ends, Reading 0, Watford 1. Second Half ends, Reading 0, Watford 1. Offside, Reading. Jake Cooper tries a through ball, but Glenn Murray is caught offside. Attempt saved. Jake Cooper (Reading) header from the centre of the box is saved in the centre of the goal. Assisted by Chris Gunter with a cross. Substitution, Reading. Jake Cooper replaces Daniel Williams. Glenn Murray (Reading) is shown the yellow card. Foul by Adlène Guédioura (Watford). Hand ball by Simon Cox (Reading). Attempt missed. Nick Blackman (Reading) left footed shot from the centre of the box is too high. Assisted by Glenn Murray with a headed pass. Substitution, Watford. Odion Ighalo replaces Troy Deeney. Sebastien Bassong (Watford) wins a free kick in the defensive half. Substitution, Watford. Lloyd Dyer replaces Ikechi Anya. Attempt saved. Nick Blackman (Reading) header from the centre of the box is saved in the top centre of the goal. Assisted by Garath McCleary with a cross. Offside, Reading. Oliver Norwood tries a through ball, but Garath McCleary is caught offside. Offside, Watford. Daniel Tözsér tries a through ball, but Troy Deeney is caught offside. Daniel Williams (Reading) is shown the yellow card for a bad foul. Goal! Reading 0, Watford 1. Almen Abdi (Watford) right footed shot from outside the box to the centre of the goal. Assisted by Ikechi Anya with a cross. Attempt missed. Daniel Williams (Reading) right footed shot from outside the box is too high. Assisted by Oliver Norwood. Corner, Reading. Conceded by Ikechi Anya. Attempt missed. Nick Blackman (Reading) left footed shot from very close range misses to the left. Assisted by Garath McCleary. Corner, Reading. Conceded by Almen Abdi. Corner, Reading. Conceded by Sebastien Bassong. Attempt blocked. Michael Hector (Reading) right footed shot from the centre of the box is blocked. Assisted by Alex Pearce. Attempt missed. Alex Pearce (Reading) header from the centre of the box misses to the right following a corner. Corner, Reading. Conceded by Heurelho Gomes. Attempt saved. Chris Gunter (Reading) right footed shot from a difficult angle on the right is saved in the centre of the goal. Attempt saved. Garath McCleary (Reading) right footed shot from outside the box is saved in the bottom right corner. Assisted by Daniel Williams. Attempt missed. Glenn Murray (Reading) right footed shot from the left side of the box misses to the right. Assisted by Jordan Obita. Corner, Watford. Conceded by Jordan Obita.